Current Affairs 19th March 2019: Instantly obtain Latest Current Affairs 19th March 2019 with all essential info, Be the first to know all the Current affairs 19th March 2019 top news, Major Issues, Current happenings, Important events in National as well as International level with clear explanation. 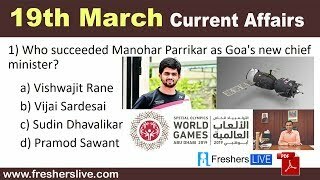 For all competitive exams and Interviews, equip yourself with the Latest Current Affairs 19th March 2019 granted here. Bengaluru FC clinched their maiden Indian Super League title as Rahul Bheke found a championship-winning header in the dying minutes of the final against FC Goa, in Mumbai. The two teams were locked 0-0 after 90 minutes. Even the first extra time saw no goals but Bengaluru got better of a 10-men Goan team 1-0, four minutes from the end of the second extra half. Indian youth team finish second in the overall medals tally with a total of 26 medals including eight gold, nine silver and nine bronze medals. China topped the overall medals tally with 31 medals that included 12 gold, 11 silver and eight bronze medals. Japan finished third with 20 medals that included 6 Gold, 8 Silver and 6 bronze. Asian Youth Athletics Championships 2019 was held in Hong Kong. Indian shuttler Sai Praneeth won the silver medal at the Swiss Open after losing the men's singles final to world number two and top-seeded Chinese shuttler Shi Yuqi in Basel, Switzerland. About 2019 Swiss Open: The 2019 Swiss Open, officially the YONEX Swiss Open 2019, was a badminton tournament which took place at St. Jakobshalle in Basel, Switzerland and had a total purse of $150,000. Mercedes’ Valtteri Bottas beat his world champion teammate Lewis Hamilton to clinch the season-opening Australian Formula One Grand Prix. Bottas, who claimed his first race win since Abu Dhabi in 2017claimed the extra point for the fastest lap in the race. Pramod Sawant (45), former Speaker of Goa legislative Assembly and MLA from Sankhelim in North Goa was sworn-in as 13th Chief Minister of Goa, succeeding Manohar Parrikar, who died on March 17 after a prolonged battle with advanced pancreatic cancer. Sudin alias Ramkrishna Dhavlikar of Maharashtrawadi Gomantak Party (MGP) and Vijai Sardesai of Goa Forward Party were sworn in as Deputy Chief Ministers. Nine other leaders also took oaths as cabinet ministers.